Welcome new readers, much obliged for all the attention to the reputation management story. An honour to be “Boinged” for the first time. Yesterday was this site’s highest readership in its three-year history. I guess taking 8 months to put together a blog post can pay off sometimes. I need to just make a couple little clarifications. First of all, about the headline. The fact is, I don’t really care who protects the reputation of the Bolibourgeoisie. If it’s not one person, it will be another. The point here is that the forces of opacity are winning in Venezuela. Now that the story is out (and so far no response from those mentioned), it’s worth mentioning that this story was turned down by a couple Venezuelan and a couple US media outlets. The US ones I am more sympathetic toward — it’s a weird foreign story and sadly, most people in SF or NY don’t know or care much about South America. But in Venezuela, I suspect it was rejected out of fear. This, for example: the government can cut off your supply of newsprint, sue you, and generally make your life miserable if you print the wrong thing. That makes news reporting difficult. If news people around the Americas want to offer a bit of solidarity to their beleaguered colleagues in Venezuela, one way would be to support reporting on that country. Not just quoting Michael Shifter and Otto Reich again and again, but actually learning about what’s happening in Venezuela and reporting new, different stories. Ideally, hiring some of our skilled local colleagues and not counting on fools like me who haven’t even stepped foot in the country in over a year. Venezuela is the land of low-hanging scandal fruit. After seeing a news item in Business News Americas, I was able to show that PDVSA’s new insurance broker was shady. It took about an hour of actual work, maybe less. Yes, an insurance trade mag had the story first. But behind a very high paywall. I don’t claim to have scooped it, just that it’s a story anyone could have had. This reputation story may have had a few minor effects. I see that all these sites are now offline: pornonomia.com, fustigado.com, modaenvenezuela.com, santosocorro.com, tomalaruta.com, pulcrolimpio.com, reparandoelcarro.com, teteracaliente.com, vientosdeboda.com, hottiesinamerica.com, informecandela.com, bebesano.com.ve, mueretedelarisa.com.ve, bebesano.com.ve, miralabelleza.com.ve, comoanilloaldedo.com.ve, elttdehoy.com.ve, comegatos.com.ve, comersano.com.ve, mientrasdormia.com.ve, modelosvenezuela.com.ve, venezolanosemprendedores.com, melonblues.com. Google.com, the world’s most-used search engine, appears to have blacklisted all sites related to this whole reputation management effort. 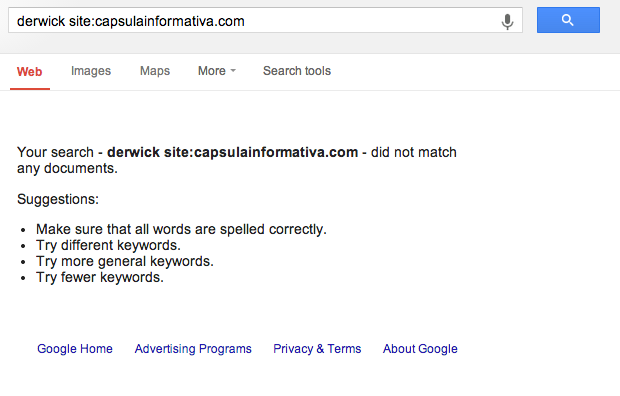 For example, Alek Boyd points out that the site Capsula Informativa is live, but a Google search for derwick site:capsulainformativa.com returns no results. Searches on Bing still bring up results at the fakey sites. I guess that’s why Google is the world’s most-used search engine. More subtly, I see that Google has quite changed the search results for “Ramiro Helmeyer”. His personal pages are now lower down, while the stories about his role in the 1990s terror campaign in Caracas take up most of the first screen of hits. 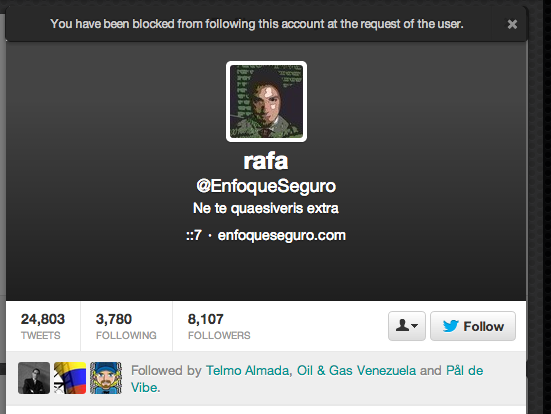 And I see that Rafael Núñez brought back his Twitter feed, but blocked me. I don’t take it personally. This entry was posted in Uncategorized and tagged housekeeping, reputation management, scam, venezuela on August 29, 2013 by Steven Bodzin. Who protects reputation for the Bolibourgeoisie? Update: This post had some effect in the world, including the disappearance of a bunch of websites. Sorry for dead links. More follow-up here. 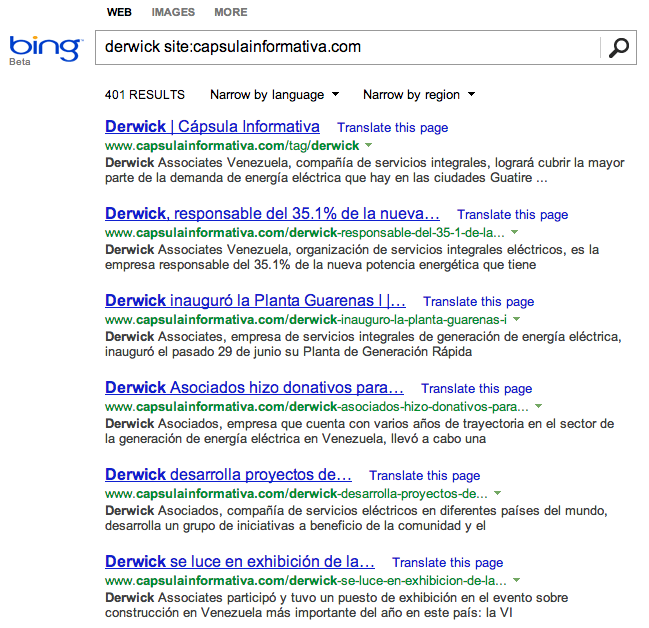 Derwick Associates is a Bahamas Bermuda*-based electricity contractor that has had great success selling power plants to Venezuelan state-owned enterprises. Those efforts have attracted attention from the press and, most recently, from former US ambassador to Venezuela Otto Reich, who sued two principals of Derwick for alleged interference with business and racketeering, also accusing them of bribery in Venezuela. Derwick is the beneficiary of an aggressive on-line reputation management campaign. 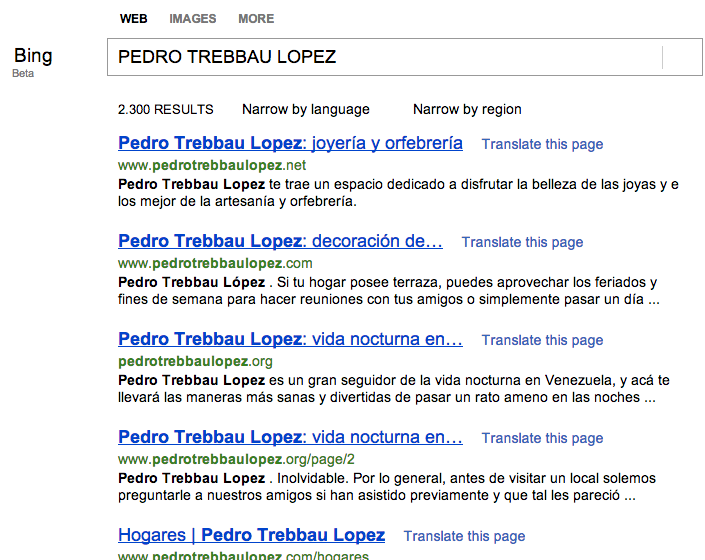 If you search the internet for terms associated with the company, such as the names of the two principals Reich accused, “Pedro Trebbau Lopez” and “Leopoldo Alejandro Betancourt Lopez,” you will find very few news articles about them. Some search engines, including Bing and DuckDuckGo, give an entire first page of spurious results (see image in upper left). Most of the results are for pages obviously designed to obfuscate, throwing banal dust into the eyes of the search engine and leaving a casual searcher with the incorrect impression that there’s nothing to see here. On Google, the first six results are such fluff. Ironically, one of the first serious articles to appear in these searches is an exposé by blogger Alek Boyd about Derwick’s reputation management. This entry was posted in Uncategorized and tagged derwick, ethics, hacking, lawsuits, ovarb, reputation management, smartmatic, venezuela on August 27, 2013 by Steven Bodzin. You folks love these, so don’t mind me if I keep throwing them out there. A pal in Venezuela points out that you need a lot of 50-bolivar notes, now worth about US$1.50, just to get by, and that the 100-bolivar note remains the largest in circulation, five years after the disappearance of three zeroes from the currency so as to “strengthen it.” That’s all old hat, but it drives me to this monthly table from Venezuela’s central bank. Click it, you love Excel tables. Then, with the miracle of subtraction, I take the number of coins or bills in circulation in June, from the second sheet of that document, and I subtract the number in June 2012, and that way I can see how many new coins and bills have been put into circulation in that 12-month period. This entry was posted in Uncategorized and tagged central bank, currency, metals, mint, scam, venezuela on August 13, 2013 by Steven Bodzin. PDVSA, South America’s second-biggest oil company by sales, has changed insurers to an international consortium of Swiss Brokers, FAC, and a Lebanese company called Etoile Properties Assurances that belongs to a French company, Etoile Properties Assurance, Business News Americas reports. This entry was posted in Uncategorized on August 12, 2013 by Steven Bodzin. Eulogio Del Pino…met with the private sector and presented the Well Connection by Service Companies project to reactivate more than 1,000 wells in Lake Maracaibo. The bureaucrat explained that the project represents a pilot plan for a new contracting scheme, fed by a trust fund with payment guarantees and whose objective is to boost production. And also, the weird silence: I haven’t heard of any face-palm-inducing ridiculous proposals out of PDVSA in quite some time. We’ll see if this keeps up. This entry was posted in Uncategorized and tagged pdvsa, risk, venezuela on August 9, 2013 by Steven Bodzin. Remember how a few months ago I pointed out that the Chile census had some rather dubious statistics? Turns out that was just the tip of the iceberg. The more important problem was that the census was under so much political pressure to be the best ever that the people running the show made up some of the numbers. They failed to reach residents in a bunch of occupied homes and also failed to survey entire housing complexes, falsely marking them as unoccupied. That said, major congratulations to Chile for a prompt and honest evaluation of this scandal. How many governments are willing to face facts like this? The public release of census results in August 2012 and April 2013 provided information about total population and housing at the national and subnational level. However, it didn’t reveal that the totals included both directly surveyed population and estimated population in homes where no interview could be conducted. In the opinion of this commission, the communication omits essential information and fails to fulfill the standards of transparency required of a public office. This course of action was followed by the National Statistics Institute leadership, ignoring opinions of the institution’s professional staff. So, boo hiss and bravo. Congratulations to CIPER for breaking this story and driving the government to be so transparent about its failures. This entry was posted in Uncategorized and tagged census, chile on August 7, 2013 by Steven Bodzin.